Why? Because Obama’s national security nominees are, well, pro-Obama. Deprived of the third member of the Senate’s neoconservative Holy Trinity, Joe Lieberman, Senators John McCain and Lindsey Graham are doing their best to act like wrecking balls aimed at President Obama’s incoming national security team. Their obsessive, monomaniacal focus on the attack on the US office in Benghazi, Libya, last September is the ostensible reason, but in fact it has a lot more to do with knocking down people like Chuck Hagel and John Brennan who might go along with a tilt against Israel, a sharp cut in the Defense Department budget and a rapid drawdown in Afghanistan. Meanwhile, Senator Jim Inhofe, the ranking Republican on the Senate Armed Service Committee, says he will filibuster to block Hagel. “I don’t trust this president to make the right appointment, I don’t think that Hagel is the right appointment,” said Inhofe, adding that he wants to force the Senate to find sixty votes confirming Hagel—which means that all fifty-five Democrats would have to find at least five Republicans to join them, a not-impossible task. US Senator James Inhofe’s politically charged opening act as the Senate Armed Services Committee’s top Republican shows the panel’s self-touted bipartisanship is eroding as GOP members embrace an ideological revival. 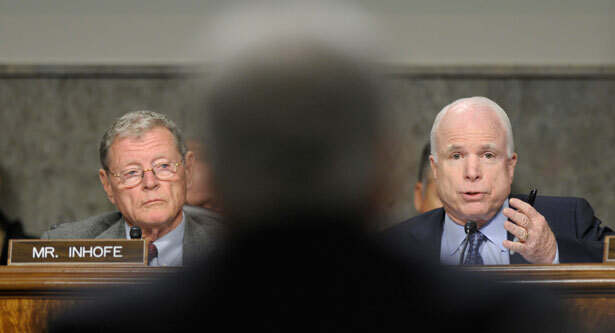 McCain, who says he opposes a filibuster, adds that he’ll vote against Hagel. I don’t think we should allow Brennan to go forward the CIA directorship, Hagel to be confirmed for secretary of defense, until the White House gives us an accounting. Did the president ever pick up the phone and call anyone in the Libyan government to help these folks? What did the president do? We know he talked to the Israeli prime minister from 8:00 to 9:00 on September 11 about a dust-up of a Democratic platform and the fact he didn’t meet the prime minister of Israel when he came to New York to visit the UN. But that’s not related to Libya. What did he do that night? That’s not unfair. The families need to know. The American people need to know. I’m going to ask my colleagues, just like they did with John Bolton. Joe Biden said no confirmation without information. No confirmation without information. Graham’s action—which was called an “unprecedented and unwarranted to stop or attempt to try to stop the nomination of a secretary of defense and a CIA director” by Senator Jack Reed, a Democrat—was echoed by the less-than-intelligent chairman of the House Permanent Select Committee on Intelligence, Representative Mike Rogers (R.-MI). who incidentally has just named Michele Bachmann to sit on that committee. So at a time of global turmoil and growing White House pressure to gut defense, the Pentagon gets a potted plant. Imagine Don Rumsfeld or Henry Kissinger declaring that they took a policy job in which they could not make policy. Mr. Hagel is unlikely to be an effective public spokesman and he lacks the knowledge to wrestle intelligently with the Pentagon’s many competing interests. Americans deserve better than a secretary of defense who merely takes orders from political aides like Valerie Jarrett.